A brand-new Ford GT Competition Series caught fire outside of Munich, Germany on Saturday, in what might be the first instance of a total write-off for the limited-run supercar. The GT caught fire around 1 pm due to what was likely a “technical fault,” Rosenheim 24 reports, but thankfully, both the 52-year-old driver and his son were able to make it out of the car safely. 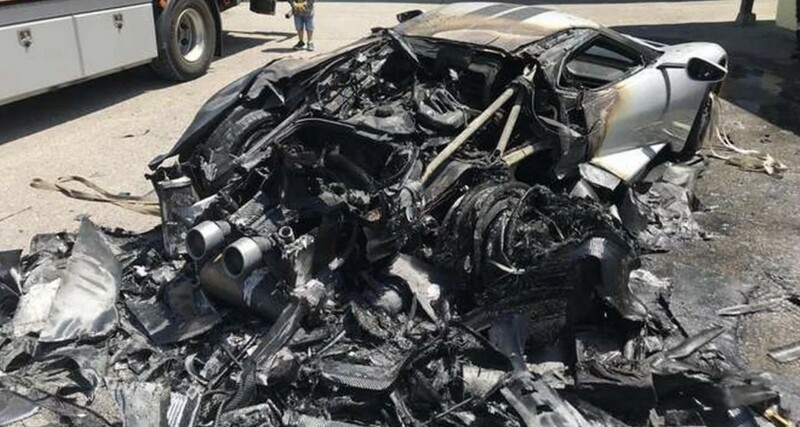 The Ford GT was left in a much sorrier state, the engine cover completely burned away to reveal a charred, blackened engine bay and a well-toasted section of the integrated roll cage. From the looks of things, the flames started to reach the back half of the cabin, but they were put out before reaching too far forward. The lightweight supercar had just 70 km or so on the odometer. This being a Competition Series model, the damage is estimated by the police to be around €500k (about $580k US). The Ford GT is inarguably one of the most desirable cars in production today, with historical significance, exclusivity, and numerous racing successes all conspiring to cement its image as one of the most important cars of the decade. Up until now, the only real debacles the road-going GT had been involved in related to new owners violating the terms of their buyer’s agreements by flipping their GTs for profit soon after taking ownership. I would be scared to death to drive this piece of junk.